Car parking access has long been an issue in over-development applications in Darebin. 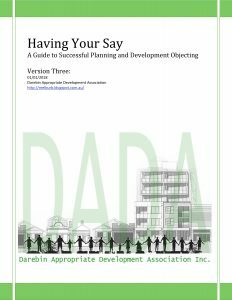 Here is a chance to influence a new parking strategy for Darebin. Follow the link to complete the survey. Council is currently developing a car parking strategy for Darebin and wants to hear the community’s views on how parking can be managed in the future. The consultation process will run until mid-February 2019, and there are multiple ways you can have your say, including attending a community forum or small discussion group, or completing an online survey. You can find more information at https://www.yoursaydarebin.com.au/parkingstrategy. This web site also contains frequently asked questions and provides more information about the car parking strategy in general. We would very much like to hear your views and those of people that you may know. Please feel free to circulate this information.